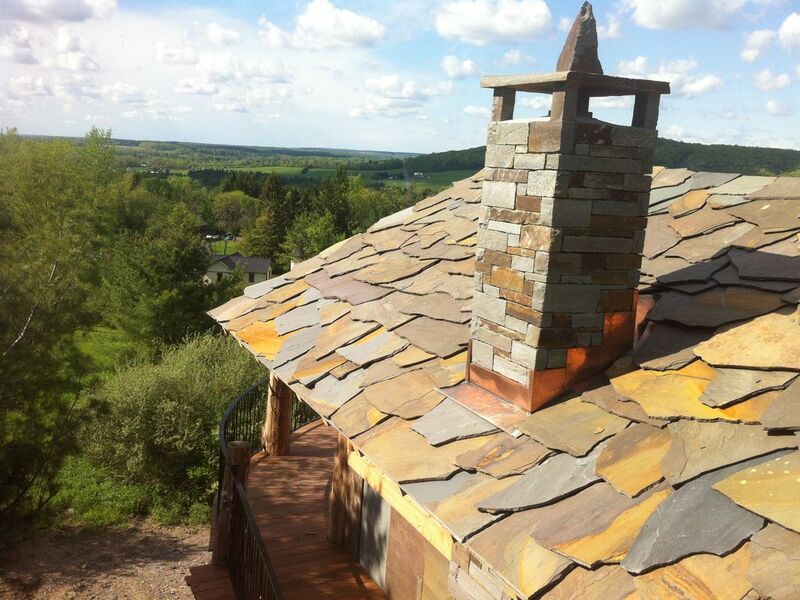 Welcome to the Stone Quarry House nestled in the hills just two miles east of Ithaca. Luxuriously furnished with Tempurpedic beds, pressed high-count cotton sheets, Jacuzzis and en suite baths, hand-knotted carpets and Stickley furniture, each of our four free-standing private living spaces is a calm retreat from everyday life. Located just minutes from Cornell University and Ithaca College, Stone Quarry house is also convenient to downtown Ithaca and many beautiful walking trails through Ithaca's gorges. Whether you are here for a weekend or a season, Stone Quarry House is the place to stay. Eco-tourism and Staying Green: We've purchased wind power from the energy grid in the past, but in the summer of 2008 we installed a large solar array and we tripled that in 2011. We continue to work toward energy conservation efforts, but the solar panels meet our energy needs now, even giving us enough electricity for two electric cars. We clean with eco-friendly products and hanging our sheets out to dry in the fresh country air whenever possible. Local Food Renaissance: Central New York is enjoying a blossoming of local food resources. The Ithaca Farmer's Market is full of locally grown produce and ready to eat foods. Our restaurants are adding locally grown ingredients and many are building their cuisine around local and seasonal foods. Vegetarian Ithacans have splurged the Moosewood Restaurant. Now the omnivores among us are glad to see local pasture-raised meats showing up on many area restaurant menus. Ask us about our favorites which include Agave, Just a Taste, Bandwagon Brew Pub, Ithaca Beer, Hazelnut Kitchen, Suzanne's, and many more. We've joined the local food effort by adding a small flock of chickens and fencing off a large section of the meadow behind the garden and the stone cottage for them to graze safely from preditors. We supplement their foraging with local organic grains, resulting in eggs which are naturally high in protein and Omega 3's. They are fun to watch and the eggs are wonderful. We added a larger garden, arbor and small orchard in 2009. Let us know if you are interested and you may be able to join in a picking party, try your hand at canning or drying food, or just try some really local fresh eggs. Buzz and Nancy met in 1990 and have slowly transformed the property as they've raised their children there. Buzz is from Ithaca, and Nancy's paternal family has lived in upstate New York for almost 200 years. Her maternal family is from Brooklyn. They both love traveling, and appreciate the new ideas they pick up when away from home. Buzz's family has had a stone quarry here since 1956 when they took it over from Cornell University. Stone is no longer quarried here; the stone fabricating business was sold in 2012; the quarry is being reclaimed, and the neighborhood is increasingly residential. We love the hillside meadow, the woods, the pond, the gardens, the orchard, the root cellar, the views . . . though with about eleven acres, it all keeps us busy! The main house was a Cornell Farm Service home Buzz moved here in 1987. After renovating the main house and raising our children, in 2003 Buzz built a garage with a 700 sq. ft. apartment for extended stays on the second floor. It was so popular, he built the stone cottage two years later. The tower cottage came along in 2012, and in August of 2014, the hillside cottage was opened. Each is unique, but all are supremely comfortable. Buzz started with a blank palate here, as the property was old quarry land. If Buzz isn't golfing, he is happiest taking an idea from paper to stone and wood. In 2016 he began a new business, Tiny Timbers, building small post and beam houses which are particularly appealing to those downsizing or looking for a second home. The local hemlock and many windows contribute to a design that feels particularly well integrated to the beautiful environment in the region. Buzz enjoys design, and our travels have subtly influenced each new building. The local blacksmith, Duran Van Dorn, has contributed his unique style as well. Nancy enjoys the interior design, keeping the focus on guest comfort while considering sustainability and utilizing the local producers of fine furnishings, particularly Stickley, Harden and J.W. Southard. Guests are encouraged to make themselves at home - walk the grounds, relax on the patio, or the hammock under the poplars, or the swing down by the pond, watch the swallows by day or fireflies on summer evenings, maybe catch a glimpse of the chickens or observe the ducks on the pond. Nights are quiet and days can be as busy or relaxing as you'd like. Air conditioning in Apartment, Stone Cottage and Tower Cottage. Heat pump in the tower cottage, gas hot air in the stone cottage, baseboard hot water heat in the apartment, wood stove in the hilltop house. All cotton high count sheets and duvet covers, many organic. Let us know if we can provide yoga mats or resistance bands or weights. You are welcome to use the exercise room in the main house where there are rowing and Pilates machines (reformers and & chair). Small wood-burning stove in the Hilltop House. Apartment, Tower and Hilltop House have living rooms; Stone Cottage is a studio. Apartment has full refrigerator; Cottages have undercounted refrigerators. Apartment has gas stove, Cottages have induction burners. Apartment has oven; Cottages have toaster ovens. All rentals have microwave ovens. All rentals have a French Press and an electric kettle. All rentals have sets of dishes, glasses, mugs, and silverware. Apartment and Hillside Cottage have full kitchens; Stone Cottage and Tower Cottage have kitchenettes. Apartment and Summer House have seating for six; Tower Cottage has seating for four; Stone Cottage has seating for two. Cable in the apartment, stone cottage and tower cottage. No cable in the Hilltop House. Let us know if you would like to borrow a game. Stone dining table with market umbrella, five chairs, four lounge chairs with footstools, and a love seat provide a comfortable outdoor area for relaxing and meals. Eco-Friendly cleaning practices, solar and wind powered utilities. Relax with the hammock, swingset, walled garden, and large yard. WiFi, wireless high-speed internet access in the apartment, the stone and tower cottages and the hilltop house. A unique and attractive property which suited our needs. We specifically chose this location to accommodate traveling with our dog. The cottage was private and peaceful, our hosts were friendly and unobtrusive. Wish we had had more time to relax and enjoy the fireplace and amenities. Perfect get away spot for relaxing! Start a fire, sit in the jacuzzi and order some delivery from Luna! Nancy is the nicest lady. Beautiful stone work through out cabin! Feels very high end and classy. We had a delightful stay. The property is so charming and lovely, and a very nice change of pace from a hotel. I should not give away the secret, but this is very close and convenient to Cornell's campus for any visiting parents. Thanks so much for staying with us and for taking the time to write a review! I’m sorry I didn’t meet you, but I hope you’ll be able to return in the future. We ended up in the Tower. If you're on the skinny side this is a nice cozy cottage. All the buildings are in close proximity closer than it sounded in the listing. We booked based on the desc. & title suggesting the stone cottage w jacuzzi. The listing is for all buildings & it's not clear whats avail. The amenities listed arent for all cottages. Had we canceled we would had lost out on paid monies & had to wait 2 weeks for any part of a refund. It happened to be a busy time to be in the area between events & college students & parents coming to town so we didnt have much of a choice but to stay. As I have a foot injury & am not the smallest of person we had to sleep on the pull out sofa. The stairs to the tower narrow, the balcony door is even smaller. A 2 night stay cost just over 600.00. We didn't end up w a Jacuzzi nor a place to have a romantic getaway together. After an uncomfortable sleep by the 2nd night my husband went to the tower to attempt to get a better night sleep. Tight squeeze up, but he made it the rest of the night. Unfortunately I found reviews on other sites where guests have run into the same problem w/ booking, suggested the listings be separated & this has not been done. If you decide to book make sure you know the specific spot you want is available for sure before paying. I also asked for suggestions on a few things & tried to get info for a few days prior to going, even delayed our departure from home to ensure getting a response. No return phone call & questions weren't answered. Not worth the price when not getting what paid for. A full refund should have been provided, at minimum a reduced price. We were greeted by Nancy upon arrival, she was kind enough to lend an umbrella. In a cottage I expect a bug or two but not spiders & carpenter ants in my bed. Pillows were amazing. I have herniated discs & had surgery in the same area about a year ago. Good pillows are hard to come by. I actually looked for the tag, and could had purchased it had I found th e same one online. Prior to booking take note of any instructions on the web pg as once it's booked its a struggle to find the same info again. The tower cottage has a hot plate, coffee press, water kettle electric fridge and microwave. Soap is provided. The stonework/tile is beautiful. Shower can be very slippery & theres not a ton of pressure. Feels like the soap isn't washed off but it is. Bath towels also supplied. Fridge worked well even the freezer had ice made. I'm so glad you appreciated the pillows - we use the same high count linens and comfortable pillows and duvets in the rentals that we enjoy on our own beds because we value a good night's sleep. Each of the rentals is unique, and although the tower cottage doesn't have a Jacuzzi, I'm glad you liked the tile work in the tower cottage. In the winter months the heated floor tile is particularly nice. The 'soft' water does leave you feeling slippery, though as you point out, the soap really is removed. I hope you discovered how nice and soft your hair feels after washing it in soft water. I'm sorry the tower cottage wasn't a good fit for you. It is hard to relax and enjoy yourself if you are feeling dissappointed before you arrive. Yours is the first complaint we've had about the sleeper sofa. Perhaps a second memory foam mattress topper would have helped? I hope you slept better the second night, when there was more room to get comfortable. Regarding the clarity of the listing . . . It is our policy to send an informational email prior to approving any reservation. The email discribes each of the rentals, our policies, and which rentals are available for the dates needed. In this case it stated in the second sentence that the tower cottage and the hilltop house were available, and the stone cottage and post and beam house were not. The reservation was not 'pre-approved' until 45 minutes after that informational email had been sent. Usually I would have waited longer and given you more time to consider it, but I was under the impression that you were in a hurry to confirm a reservation. Given that I was traveling all day, I wanted to make sure you weren't unsure, wondering if you had a reservation or not. We were traveling to an out-of-state family event when your inquiry arrived, yet responded five times within four days to your concerns regarding the reservation - at one point offering a full refund of any payment we had received from HomeAway. That offer was declined. Thanks again for your thoughtful review. It is always helpful for us to know what we can do better, and what our guests enjoyed. The post and beam house was like a home away from home. Great place to come back to after enjoying Ithaca. Thanks so much for your review! Your experience was just what we hoped for when we built the post and beam house. Ithaca is a community full of active artists and musicians. It is a rare night that doesn't offer a live concert or theater event. The Cornell Concert series offers world renown classical and jazz artists as well as exciting world music. A veritable treasure chest of resident musicians frequently play at local venues. Famous for its gorges and state parks, Ithaca has countless hiking trails. Sapsucker Woods Bird Sanctuary and the Cornell Plantations, some of the most beautifully walks in Ithaca, are just minutes from Stone Quarry House. Nearly twenty screens at Ithaca's movie theaters show a wide range of films from blockbuster hits to lesser known art films you would only expect to see at film festivals or in larger cities. Dine out at the world famous Moosewood Restaurant, or choose from one of many other fine restaurants in town. Ithaca is famous for its International Cuisine. Golf: Ask about access to the Robert Trent Jones designed golf course at Cornell. Buzz is a frequent golfer, and he may be able to help you set up a time to play or advise about other area courses. Ski: Winter offers its own fun: you can cross country ski right out your front door, or drive twenty minutes to Greek Peak, the largest ski resort in Central New York. Winter also means sledding and ice skating on our own Stone Quarry House pond, or one of three indoor rinks in Ithaca. Hillside House rates are $50 more per night than regular rates and post and beam house rates are $30 more per night than standard rates. Any reservation including a weekend night will have two nights billed at the weekend rate, unless discounted by the owner. Contact us directly for extended stay or monthly rates.